On behalf of the members of the Middleton Police Department, I am pleased to present you with the 2014 Annual Report for the Middleton Police Department, which can be downloaded by clicking on the image below or by visiting our website, MiddletonPD.com. The photo on the cover of the 2014 Annual Report shows the men and women of the Middleton Police Department. This picture looks significantly different than it would have last year at this time due to an unprecedented change in personnel. 2014 saw the retirement of Chief Brad Keil, Captain Noel Kakuske, Sergeant Barry Reynolds and Officer Jeff Winer. Due to these retirements, the following promotions were made: my promotion to Chief; Steve Britt and Troy Hellenbrand to Captain; Travis Kakuske, Jessica Quamme and Scott Moen to Sergeant; the hiring of six new police officers and two new civilian staffers. I could not be happier with the make-up of the Command Staff and the quality, education levels and breadth of diverse experiences of the new police officers and civilian staff. Much like last year, the crime rate continues to decrease in Middleton. The overall crime rate decreased by 16% over last year, this is the lowest crime rate in Middleton in over ten years. These figures include a 19% decrease in Assaults, 34% decrease in Burglaries and 65% decrease in Thefts from Auto. Heroin abuse continues to be problematic which has led to an increase in robberies, overdose cases and two overdose deaths. The Police Department continues to work collaboratively with our partners in enforcement, education and prevention efforts. In early 2014, the Department achieved accreditation through the Wisconsin Law Enforcement Accreditation Group (WILEAG). A three day assessment of the Department took place in January and the Board met and determined the Middleton Police Department met the 235 standards necessary to achieve accreditation, a feat only accomplished by 5% of the 393 law enforcement agencies in Wisconsin. We cannot rest on our laurels, this is an ongoing process and while the next assessment does not take place until 2017, Accreditation Manager Captain Troy Hellenbrand continuously works on making certain the Middleton Police Department meets national standards and best practices and has assigned numerous staff members to assist him. 2014 was a challenging year for those of us in the law enforcement profession. I think many of the controversies in 2014 have opened dialogue, which has been necessary and useful as we introspectively examine how we deal with the people we serve in our community. We’re not perfect, we have and will make mistakes, but I am genuinely heartened by the community support we receive. We continue our community outreach programs. Please follow us on our website, Facebook and Twitter or feel free to stop by for a visit or contact us at 824-7300. This service is provided to you at no charge by the Middleton Police Department. 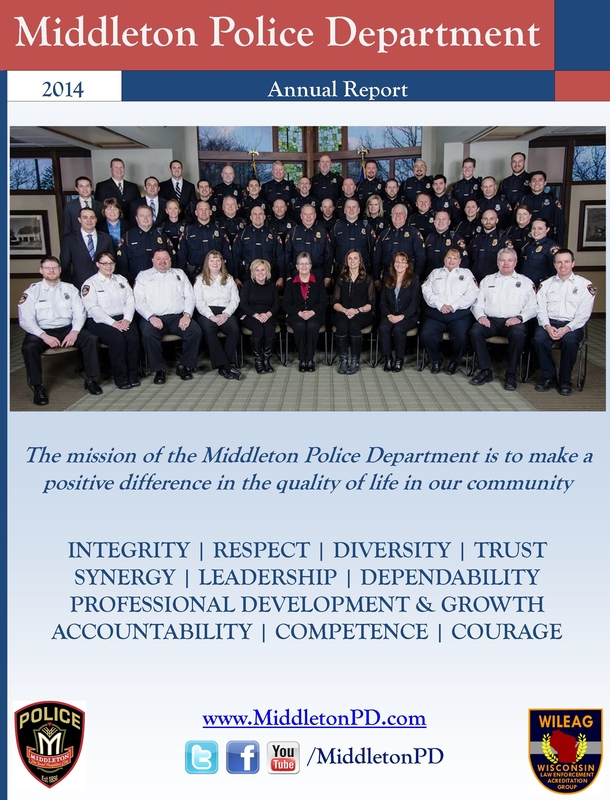 On behalf of the members of the Middleton Police Department, I am pleased to present you with the 2014 Annual Report for the Middleton Police Department, which can be downloaded by clicking on the image below or by visiting our website, MiddletonPD.com [http://middletonpd.com/] . In early 2014, the Department achieved accreditation through the Wisconsin Law Enforcement Accreditation Group [http://www.wileag.info/] (WILEAG). A three day assessment of the Department took place in January and the Board met and determined the Middleton Police Department met the 235 standards necessary to achieve accreditation, a feat only accomplished by 5% of the 393 law enforcement agencies in Wisconsin. We cannot rest on our laurels, this is an ongoing process and while the next assessment does not take place until 2017, Accreditation Manager Captain Troy Hellenbrand continuously works on making certain the Middleton Police Department meets national standards and best practices and has assigned numerous staff members to assist him. We continue our community outreach programs. Please follow us on our website [http://www.middletonpd.com/] , Facebook [https://fb.com/middletonpd] and Twitter [http://twitter.com/middletonpd] or feel free to stop by for a visit or contact us at 824-7300. Update your subscriptions, modify your password or email address, or stop subscriptions at any time on your Subscriber Preferences Page [http://www.ci.middleton.wi.us/list.aspx] . You will need to use your email address to log in. This service is provided to you at no charge by the Middleton Police Department [http://www.middletonpd.com/] .